This CellML model runs in both OpenCell and COR. The units have been checked and they are consistent. In order to balance the units in a couple of equations a "balancing factor" had to be introduced (eqs 4.13 and 14.36). Also note there are two typographical errors in the published paper: eq 1.1 should be C_Pd = Q_Pd/V_Ru (not C_Pd = Q_Pd*V_Ru) and eq 8.2 P_Fu_InFu = Y_Fu_InFu*D_Fu (not P_Fu_InFu = U_Fu_InFu*D_Fu). Finally there are quite a few variables with undefined values. To complete the CellML model, where parameter values were missing, a value of 1.000 has been used. Note that there are some genuine values of 1. These have been entered as just 1 or 1.0. The model simulation output looks reasonable, but with no results figures in the published paper it is hard to say whether or not the CellML model accurately recreates the published results. ABSTRACT: A mathematical model is described that stimulates the digestion, absorption and outflow of nutrients in the rumen. The model consists of 17 state variables, representing nitrogen, carbohydrate, lipid, microbial and volatile fatty acid pools. The flux equations are described by Michaelis-Menten or mass action forms with model_parameters calculated from the literature. Several specific areas of improvement in representation of rumen processes were reconsidered during model development. These included microbial substrate preference, differential outflow and chemical composition of rumen microbes, recycling of microbial matter within the rumen, uncoupling of fermentation with respect to nitrogen availability, reduced microbial activity at reduced rumen pH and pH-dependent absorption of volatile fatty acids and ammonia. The model was used to examine the effects of the diet on the profile of nutrients available for absorption and was shown to respond appropriately to different intake and nitrogen levels. The validity of the improvements and the predictions of nutrient supply on a variety of dietary inputs are tested in a companion paper. Diagrammatic representation of the rumen model. Purple boxes indicate state variables and arrows indicate fluxes. 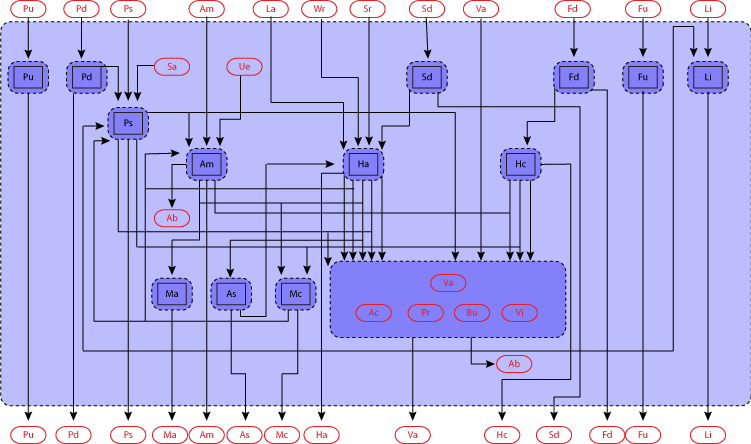 Derived from workspace Dijkstra, Neal, Beever and France, 1992 at changeset 76da47f4c532.